The painting is divided into 3 frames presenting Lord Buddha, an arhat (or the one who gains insight into the true nature of existence and achieves Nirvana), and a Buddhist nun. 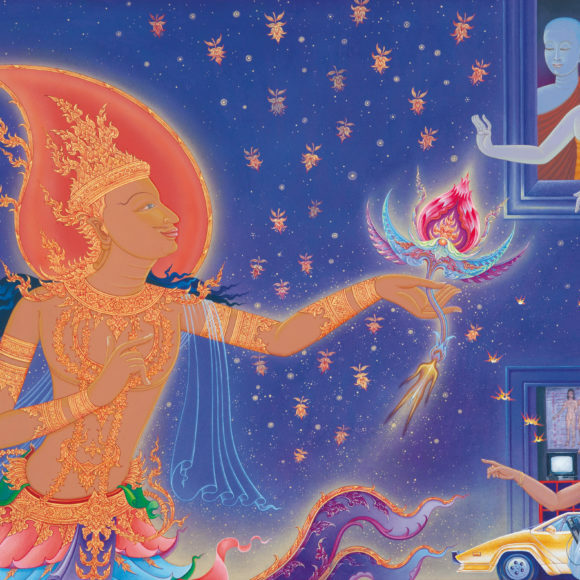 This painting conveys the message that anyone can attain the enlightenment of Dharma, regardless of status. In this painting, “water” represents defilements. The soft-looking appearance of the water represents the attainment of supreme Dharma as transcendental wisdom.